In all regions of the world are found local communities who have long histories of interaction with the natural environment. Associated with many of these communities is a cumulative body of knowledge, know-how, practices and representations. These sophisticated sets of understandings, interpretations and meanings are part and parcel of a cultural complex that encompasses language, naming and classification systems, resource use practices, ritual, spirituality and worldview. This local and indigenous knowledge is a key resource for empowering communities to combat marginalization, poverty and impoverishment. Within such a context, what may be known as traditional or local or indigenous knowledge is being addressed in a range of UNESCO activities in the fields of education, science, culture and communication. These activities include research on traditional resource use strategies and practices in land and water (including marine) ecosystems, initiatives to nurture new kinds of partnerships between indigenous peoples and multi-use protected areas, cultural dimensions of traditional knowledge and the possible creation of an international normative instrument on the protection of folklore and traditional culture, ethnobotany and the equitable and sustainable use of plant resources, synthesis and diffusion of information on local and traditional knowledge, and capacity building and the role of traditional knowledge within today’s knowledge society. This work has received further attention in the last few years, in part because of discussions on different knowledge systems linked to the UNESCO-ICSU World Conference on Science (Budapest, June 1999) and of emerging interests in developing cross-cutting activities on traditional knowledge. One specific follow-up has been the launching by UNESCO in the 2002-2003 biennium of a new intersectoral project on "Local and Indigenous Knowledge Systems in a Global Society"(LINKS). Within the broader United Nations context, at the 1992 United Nations Conference on Environment and Development, clear reference was made to traditional knowledge in the Rio Declaration and Agenda 21. Article 8 (j) of the Convention on Biological Diversity addresses the "knowledge, innovations and practices of indigenous and local communities"while one of the intergovernmental committees of the World Intellectual Property Organization is concerned with "Intellectual Property and Genetic Resources, Traditional Knowledge and Folklore". In a number of countries, particularly in the Americas, biosphere reserves provide a focus for developing innovative alliances and arrangements with indigenous peoples. The Conference of Parties of the CBD has established a working group to address Article 8(j) of the Convention, which is concerned with ‘Traditional Knowledge, Innovations and Practices’. In the Sector for Culture, strong interest in traditional knowledge has been voiced through such initiatives as those on the intangible cultural heritage, and in particular, the calls to establish an international normative instrument on the protection of folklore and traditional culture. Since June 1992, the World-Wide Fund for Nature (WWF), UNESCO-MAB and the Royal Botanic Gardens Kew have been collaborating in the People and Plants initiative on the promotion of ethnobotany and the equitable and sustainable use of plant resources. One of 25 modules in a multimedia teacher education programme published by UNESCO in 2002 as part of its function as task manager of Chapter 36 of Agenda 21 and as a contribution to the World Summit on Sustainable Development. 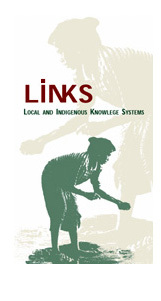 Website under construction - Launched in 2002 as a cross-cutting intersectoral project, LINKS brings together all five programme sectors of UNESCO in a collaborative effort on local and indigenous knowledge. Database prepared in co-operation with the Netherlands Organization for International Co-operation in Higher Education (NUFFIC). Ongoing activities of UNESCO’s Communication and Information Sector include a joint initiative with the MOST Programme and NUFFIC-CIRAN on multipurpose community telecentres for indigenous knowledge development, with a first pilot project in Uganda. Coastal marine resource use by indigenous Moken communities along the Andaman Sea coast in Thailand is among ongoing field projects within the Coastal Regions and Small Islands (CSI) platform. Two UNESCO-sponsored regional seminars on traditional water harvesting systems were held in Iran in May 1999 and May 2000. Assessment of long-established approaches to water management forms part of the research and action agenda of the International Hydrological Programme (IHP), UNESCO’s intergovernmental scientific programme on water resources. Respecting and protecting traditional knowledge is explicitly addressed in one of the fourteen objectives of the Universal Declaration on Cultural Diversity, adopted by the UNESCO General Conference in late 2001. Sustainable Development and Traditional Knowledge are among the fields of specialty in UNESCO’s programme on University Chairs. Among the WIPO websites is that on ‘Intellectual Property and Genetic Resources, Traditional Knowledge, and Folklore’.